FL landlords, is your tenant behind in the rent? Serve him/her with this Florida 3 Day Notice of Demand for Unpaid Rent. The Notice is given under Section 83.56(3) of the Florida Statutes. 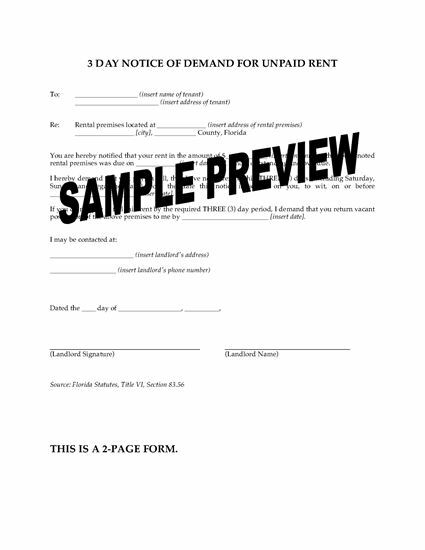 The notice informs the tenant that s/he must pay the overdue rent within 3 days of receipt of the notice. If the tenant fails to pay the rent within the 3-day period, the landlord will commence eviction proceedings to force the tenant to vacate the premises. Pay for the form once, and you can use it as often as you need to. This Florida 3 Day Notice of Demand for Unpaid Rent template is provided in MS Word format, and is fully editable.